Breathe. Airport travel just got easier. Photo: Tomas Sobek / Flickr. Rush through airport traffic. Drag bags through winding check-in line. Unload and reload at security. Squeeze into seat and shake off cramps for hours to come. Cyrena Lee interrupts the madness of airplane travel to find nirvana where she least expect it: in the airport's yoga room. SAN FRANCISCO INTERNATIONAL AIRPORT – I was exhausted. I had taken a road trip with my boyfriend from New York to San Francisco. It consisted of ten days in a car, with many pit stops along the way. I was ready to go home. I needed to sleep in my own bed. The return trip would be mercifully faster. My sister had moved to San Francisco and was keeping the car, so we flew home. Our final drive together was to SFO International Airport. After a teary goodbye, my boyfriend and I braced ourselves for one last six-hour stretch of leg cramps. We checked into our flight and dragged through security. We skipped bag check so the end of the journey would go something like this: Disembark, scuttle out of terminal, hop immediately into taxi home. We were impatient. When we cleared security, I noticed a strange sign and did a double take. It wasn't the sign for the diaper station, the smoking room, or the private first-class lounge. It was a sign for yoga. Peace and quiet beyond the doors. Photo: Matt Zimmerman / Flickr. 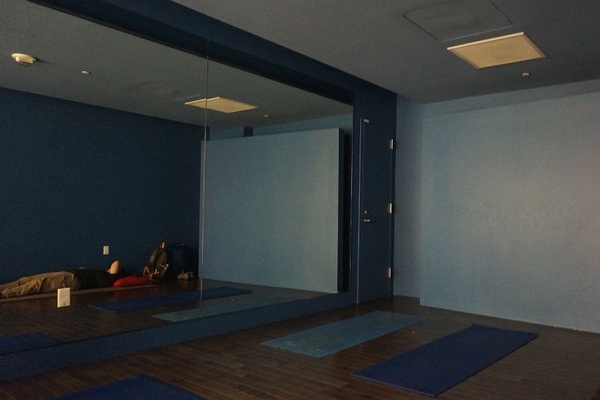 I peered inside and found a dark, quiet room with serene blue walls, hardwood floors, and yoga mats. One lone traveler was lying in peaceful shavasana. She looked so calm, her arm folded over her eyes. As if the insanity of the airport didn't even exist. We wanted in. We took off our shoes and set our bags to the side. For thirty blissful minutes, we stretched and meditated on the adventure we just had and on the incredible find we had stumbled upon. 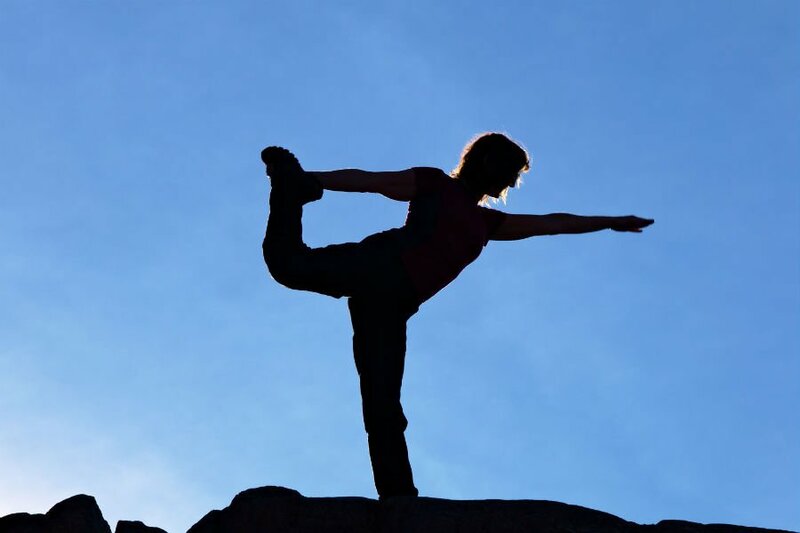 I was in downward-facing dog when the other traveler nodded namaste in my direction and left the room. We left just in time to catch our flight — and slept soundly the entire way home. It was my best airport experience yet. I love airports and all the romance associated with flying. The frenetic energy of thousands of people coming from and going to places around the world. The duty-free temptations. Even the overpriced drinks. But there is something incredible, something so unexpected, about doing yoga in an airport. It allows you time to stop and breathe in a space that asks for nothing and leaves you craving nothing. And when you're ready, you can go — go anywhere in the world you'd like. Unwinding inside the SFO yoga room. Photo: Cyrena Lee. 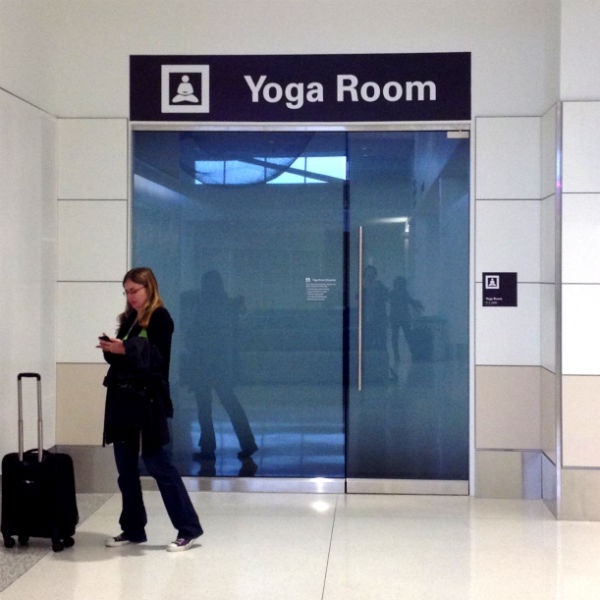 This is the world's first airport yoga room. Cyrena is an anthropologist, writer, and yogi. You can follow her on Twitter at @cyrenaly. She travels to expand the mind and to make new friends.